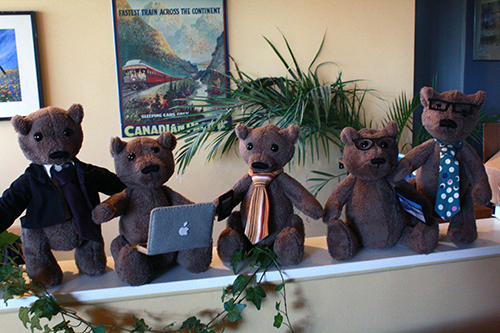 A little while back I got a commission to make teddy bears who could blend into an office of IT workers. 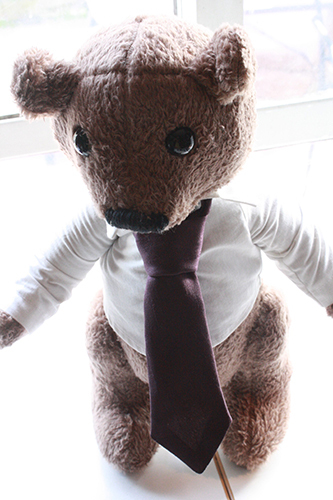 And one bear dressed for a generic upscale office job. 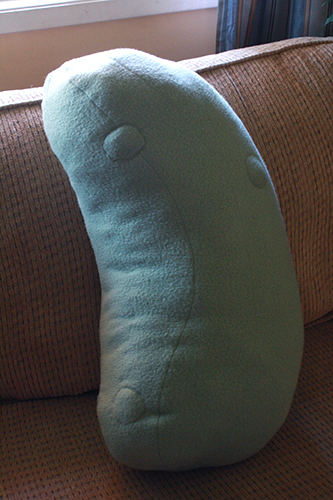 I also got a commission (a totally separate one) to make a giant pickle. 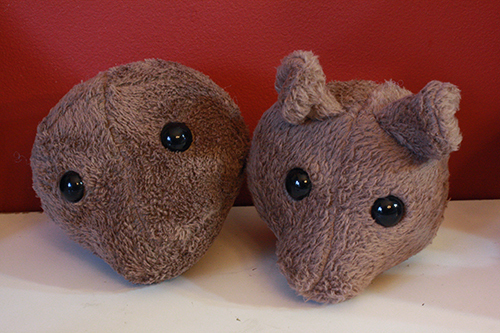 The point being that in the arena of custom plush-making, you never know what you might be asked to create tomorrow. Here’s the giant pickle. It’s 2 feet long. 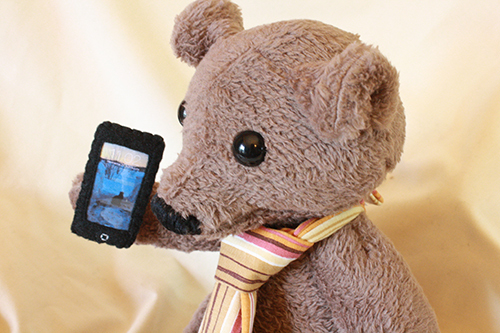 The first thing to do about the bears was to figure out how to make one. 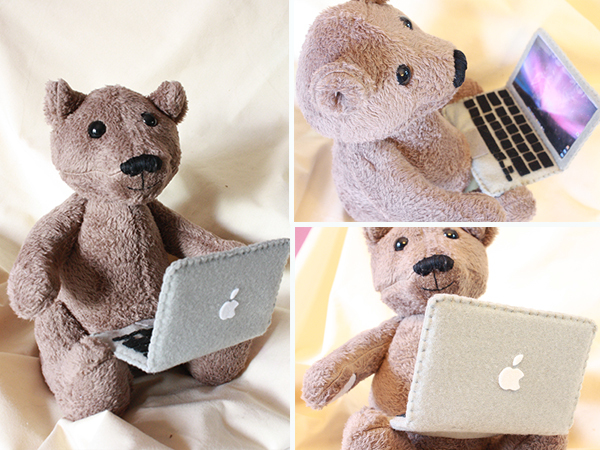 Years of plushie-making and I’d never actually sewn a teddy bear. 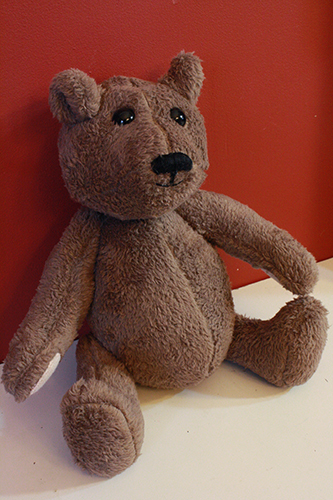 Turns out some people get religious (even cultish) about it – a friend told me that there are actually “official” teddy bear making methods that some groups insist on adhering to in order for their creations to be “proper” teddy bears, which can cost a couple hundred dollars just to make and can sell for a few hundred more than that. Some of the methods involve what specific material the bear is lined with, which is a bit strange because you’ll never see that on the outside and I don’t expect anyone who buys a $500 teddy bear is going to cut it open to be sure it’s genuine, since that kind of ruins the whole purchasing point, but whatever. It’s an interesting world. Obviously I didn’t give a crap about those sort of “official” methods, except as sideshow curiosities, but it was fascinating to hear about. 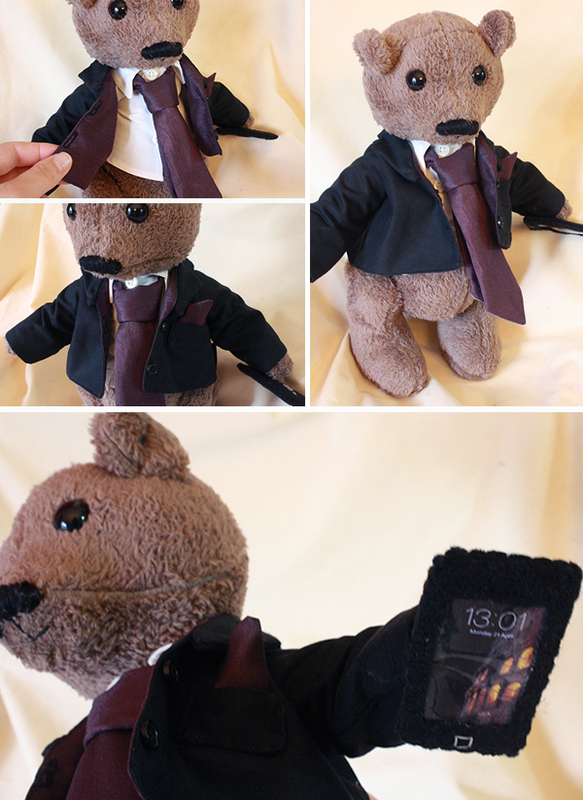 But no, I did not put any effort whatsoever into making “proper” teddy bears. I just tried to make teddy bears that were cute and fuzzy and looked like teddy bears. Seems to me that ought to be the whole point. Anyway, I did my usual thing where I Google image searched and took screenshots of all the bears I liked best, looked at a number of existing patterns and then glommed bits of all that together and made my own pattern and bears. The head was the hardest part. 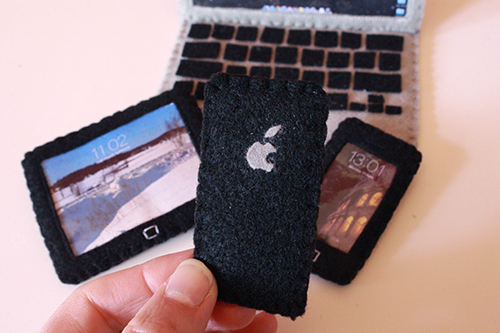 I had to keep futzing with the pattern and do 3 mockups before I felt I’d gotten one that worked. Oh, and faux fur in a fabric store is usually really freaking expensive, plus our local stores have a distinct lack of great variety to choose from, so I picked up a nice soft fuzzy brown throw blanket on sale at Bed Bath & Beyond. It gave me enough material for 5 teddy bears plus 2 mock-up teddy bear heads and a pair of fuzzy caveman boots for a costume. The first bear! I went back and shortened his arms a bit – this first fellow had a bit of a scary zombie reach going on. So the bears got figured out, and that was all good. But they needed accessories. I came up with a plan nothing short of genius, if I do say so myself. I asked the fellow buying the bears if he’d like to send screenshots of his actual computer, phone, etc. 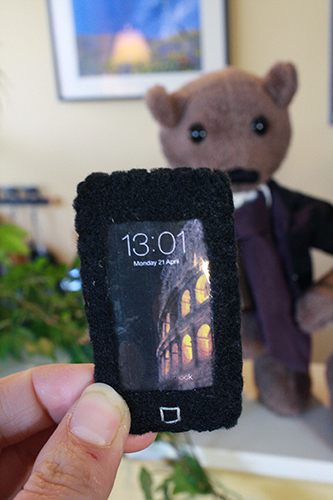 and I incorporated those into miniature devices for the bears. Very simple to do, actually. I printed out small sized colour versions of the screen shots, cut out a piece of plastic from one of those zipping soft plastic bags they sell sheet sets in, and sewed them together onto a background of felt, with a felt frame over them in the front. Then added the various details to make the devices look more like their real-world counterparts. 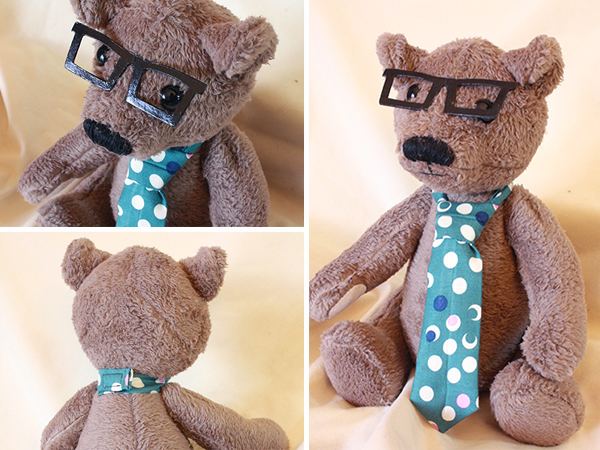 For other accessories, I went with ties and glasses, as those are general office-y type items, and mixing and matching all these things gave each of the bears a different look and personality. The ties were made from a downsized baby-tie pattern, and velcro closed in the back. 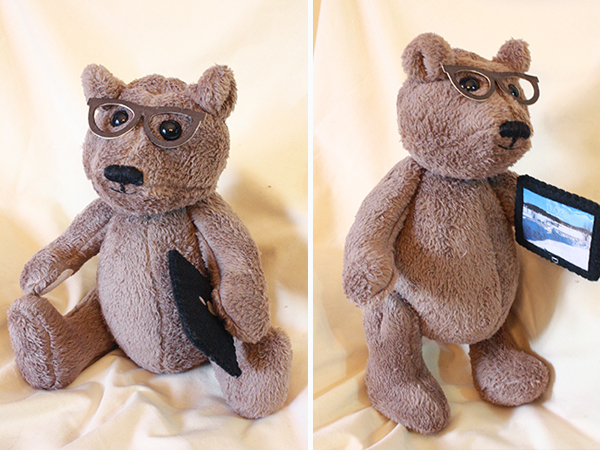 The glasses where cut and layered paper, sanded and varnished, and with a hole right in their middle that I used to sew them in place on the bears’ faces. So constructed just like those Pacman paper beads from a few weeks ago. See, that technique can be used for so many things! I don’t know if you’ve ever tried making doll glasses with bent wire, which seems like the obvious way to go, but it’s extremely difficult to make it look right and tidy. I decided it was not worth it and probably wouldn’t turn out right at all, and anyway all those popular hipster style glasses these days are the thick black or coloured plastic frames, so this paper method seemed like a better route anyway. Hello? 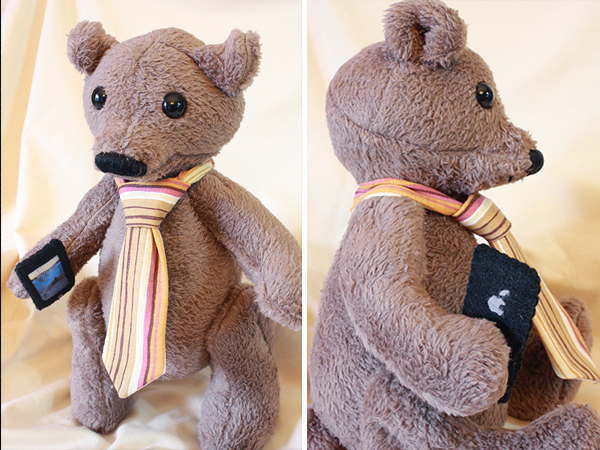 You’ve reached Ursine Incorporated tech support, how may I help you? 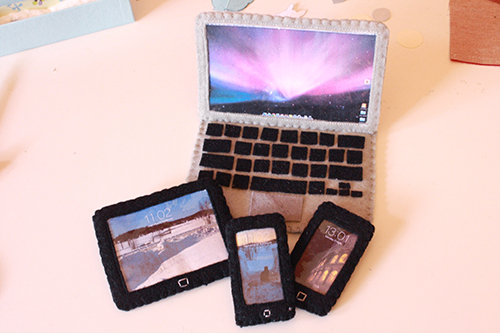 The accessories, even the laptop, were all stitched in place so they couldn’t be lost. The laptop was the tricky one, as it had to be sewn on in such a way that it sat properly, but also didn’t look stitched on. The one thing with the jacket was I’d never made one before, miniature or otherwise, so I didn’t realize until too late how the lower collar part was actually supposed to be cut and function as a folded-over piece of the jacket itself, not a separate piece as on collared shirts. So I cheated a bit there and hand stitched a separate collar piece that looks right, but isn’t actually constructed in the truly proper way. 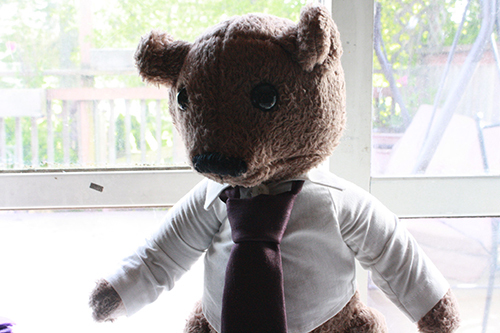 The bear looked very dashing still and didn’t offer any complaints. And then I shipped them off across the world, where hopefully they are putting in good hours and giving helpful tech advice! Johnson! Turn off that Angry Bears game and get back to work!